DIGISOL Systems has announced the launch of DIGISOL DG-GR4342L which is 300Mbps WiFi router designed for Fiber-to-the-Home solution for ultra-broadband access and triple play service. It is based on the stable and mature GPON and Gigabit EPON technology and is highly reliable and easy to maintain with guaranteed QoS, and fully compliant to IEEE 802.3ah EPON standards. 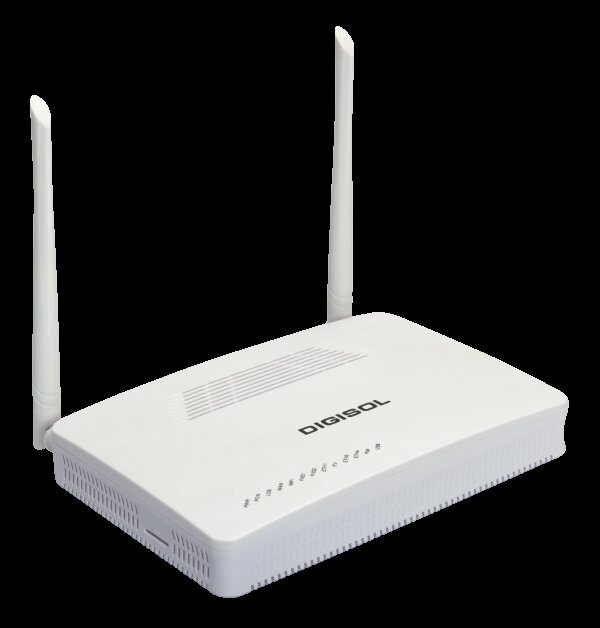 DIGISOL DG-GR4342L GPON router allows users to access high-speed internet connection via the GPON port and the devices to connect wirelessly at 300Mbps wireless 802.11n speeds. It offers a perfect terminal solution as it converts the fiber optic signal into the electric signal at the user side and enables reliable Fiber Optic Ethernet services to business and residential users through fiber-based network infrastructure. This router is compliant with the ITU-T G.984 GPON standards and supports maximum data rates of up to 2.5Gbps downstream, 1.25Gbps upstream. The users can get high-speed GPON services and bandwidth-intensive multimedia applications much easier and faster than ever before as claimed by the company. DGGR4342L features dual mode ONU and works on both GPON and Gigabit EPON technology which can detect and exchange PON mode automatically. The device supports advanced Dynamic Bandwidth Allocation (DBA) which helps in bandwidth and traffic management of ONU. The WAN supports bridge/router mode for mixed applications and also supports 300Mbps Wi-Fi with multiple SSID. Is also supports dual-stack (IPv4 and IPv6) to ensure compatibility with the next generation of the Internet and enables a range of new services and improved user experience. It supports NAT/firewall and the layer 3 routing functions as well as stated by the company. The DG-GR4342L router is priced at Rs. 6,999. Previous articleSo, You Want to Work in Artificial Intelligence?